PRODUCT DESCRIPTION: The Dustin Mizer is a special applicator designed for applying dust. It will enable you to apply dust uniformly over garden plants and flower beds. It is lightweight, works by cranking and will propel a dust up to 25 feet. Best of all, with the optional deflector featured, you will be able to direct your dust direction to the bottom sides of plants where aphids like to hide. This can be accomplished without having to bend over which makes for easy applications. 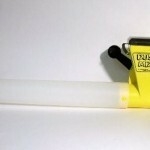 The Dustin Mizer is extremely easy to use and makes applying Drione Dust a breeze. I have huge decks all the way around my house so I was able to quickly apply the dust on the decks which allowed the dust to settle between the boards. I also used it to apply to the siding, around the windows, along the gutters, and around the perimeter of my home. Highly recommended for quick and thorough application.